Cleantech market entry advice from experienced players on the ground in China. Cleantech research and advisory firm Kachan & Co. has published a new report providing insights and advice on the cleantech market in China–including recommended solutions to the challenges Western companies face in pursuing cleantech opportunities in China. Amid continued financial headwinds for cleantech companies globally, bilateral trade disputes in solar and wind and intellectual property concerns, China’s policy and spending targets on all technologies clean and green is increasingly attracting Western cleantech researchers, entrepreneurs and companies. China has dramatic energy, resource consumption demands, and consequential pollution mitigation needs. The government is focused on maintaining the country’s economic momentum while trying to slow negative ecological impacts. That means growing opportunities for Western cleantech interests – provided they are able to compete effectively. “More China related queries come our way every week as small and medium cleantech companies investigate China, so we wanted to share market entry advice from experienced players we work with on the ground there,” said Dallas Kachan, Managing Partner, Kachan & Co. The report provides insight into cross-border cleantech cooperation with China, and discusses critical challenges and relevant strategies for facing them that Western cleantech providers should consider in China. “Western companies need to be ready for the long haul, and that means carefully constructing win-win collaboration scenarios with capable Chinese partners that seek the same goals,” Kachan said. The 25-page report analyzes comments and advice from senior China-based cleantech professionals surveyed and interviewed on the challenges, openings and strategies for successfully cooperating with Chinese partners. Results counsel Western cleantech companies to be flexible in cooperation structures, to plan to spend extra effort on partnerships than they otherwise might have been expecting and to be on-the-ground. 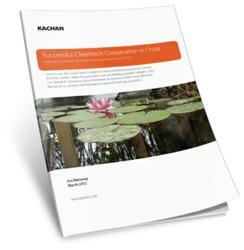 The free report is available for immediate download at http://www.kachan.com/research/cleantech-success-cooperation-china-business. The report is intended for cleantech researchers, entrepreneurs, and executives who are considering China for opportunities in capital and commercialization, and for sales that may not be as readily available in their home countries. Kachan & Co. is a cleantech research and advisory firm with offices in San Francisco, Toronto and Vancouver. The company publishes research on clean technology companies and future trends, offers consulting services to large corporations, governments and cleantech vendors, and connects cleantech companies with investors through its Hello Cleantech™ programs. Kachan staff have been covering, publishing about and helping propel clean technology since 2006. For more information, visit http://www.kachan.com.